That second one worries me, more rain? This is not what these people need. Maybe it’s good we left when we did. The last post left off with us at the port city of Chimbote. 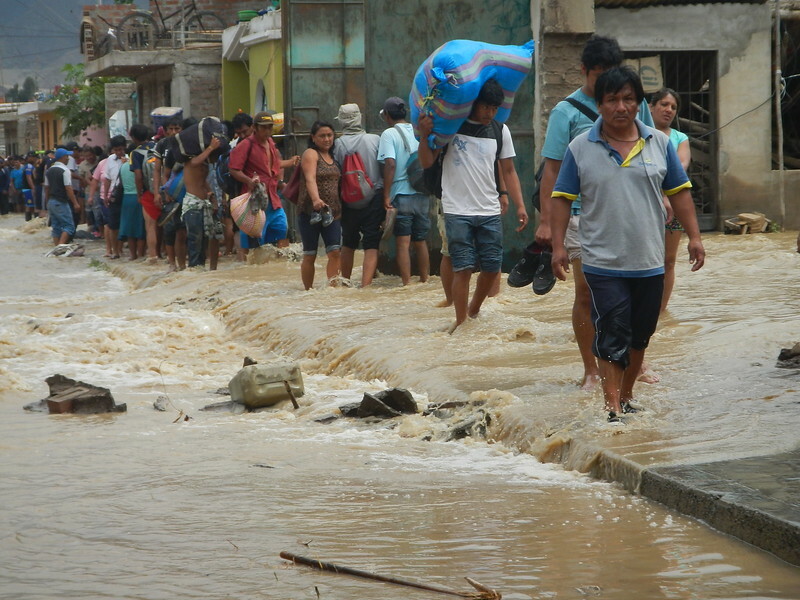 We decided to spend an extra day there because the reports about the flooding to the north were dire. 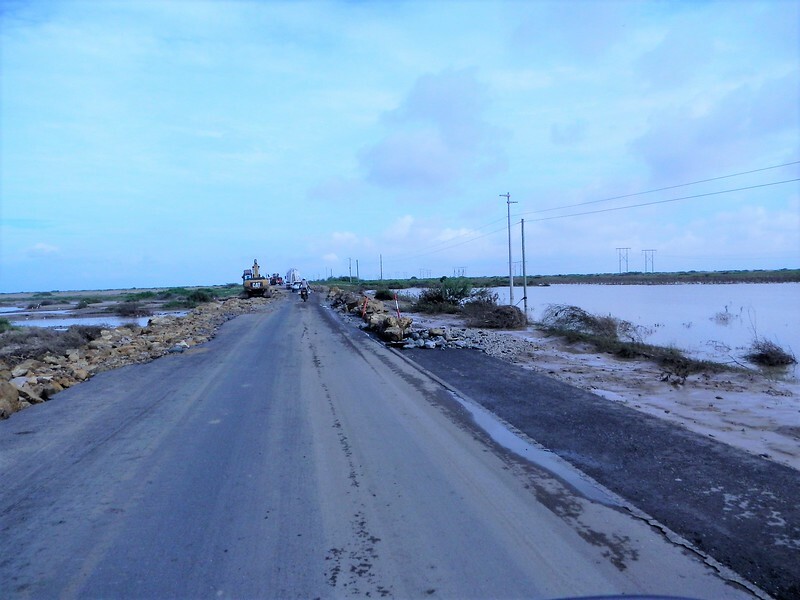 There was even more rain and roads that were temporarily opened were washed out again or new washouts and flooding was occurring. 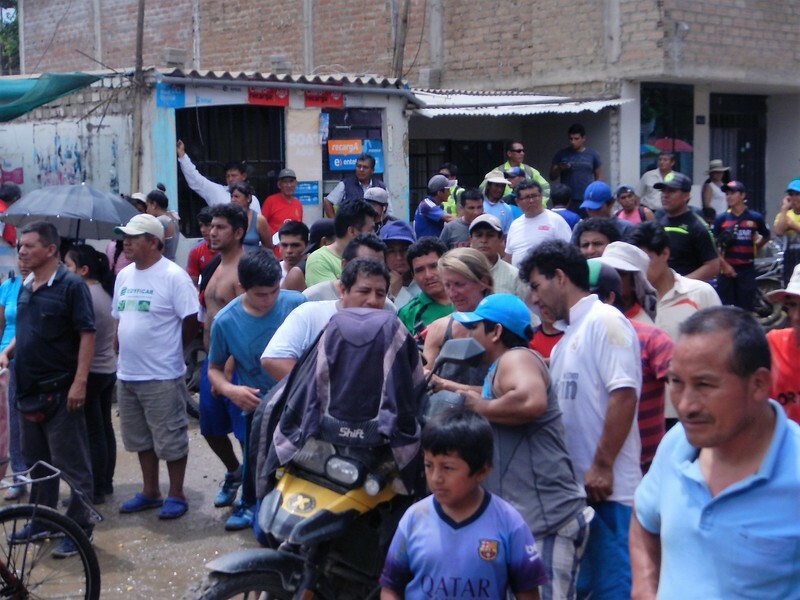 The 24 hour news coverage seemed to be focused on Trujillo, Piura and Sullaria. Three cities we needed to pass through. 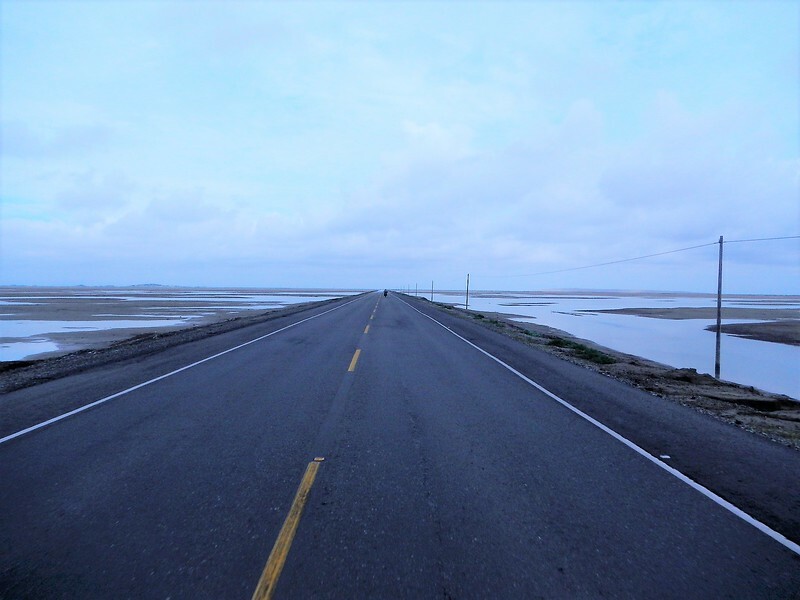 An online community of travelers developed with road reports and transfer of knowledge. Between Facebook, ADVrider and WhatsApp we were able to put together a picture of the situation. It wasn’t good. Nobody was going anywhere. On ADVrider I met another stranded moto traveler, Nicholas who was stuck in a city just a few miles north of us. We connected on WhatsApp and decided to leave on Thursday March 23 to see if we could make it. Nobody else online had been successful, the official website said the roads were closed and the police recommended nobody travel. What could go wrong? We were most fortunate to meet Nicholas online. He was trying to get home to Colombia from his three month trip to Ushuaia. Nicholas spoke excellent English and of course was a native Spanish speaker. I can’t say how much that helped in the process. 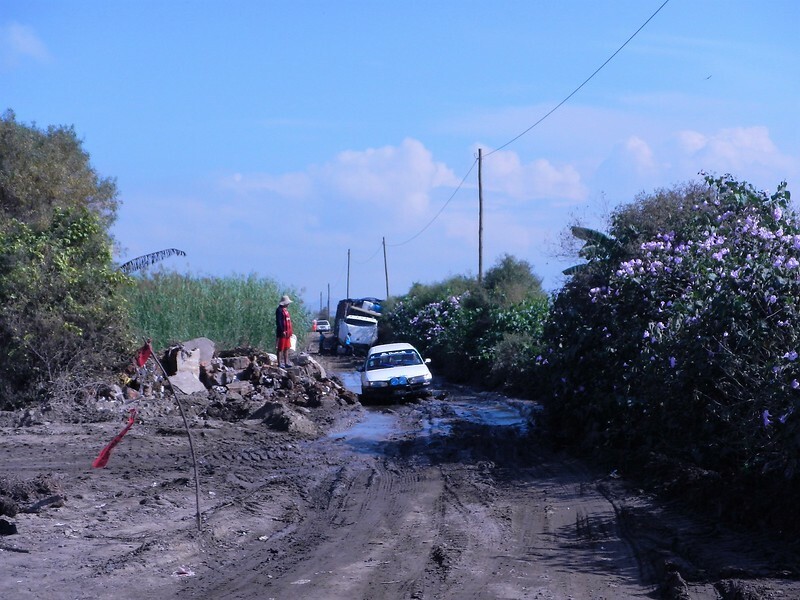 The car was getting through but the truck was hopelessly mired in the mud. A couple of guys were there with shovels digging it out. This road went on like this for a long distance, at least a few miles. Good thing we’ve had all that practice riding in mud…. There is the river crossing up ahead. Supposedly, at this point it was possible. Hey Nicholas… you go first! Ok.. only almost to the top of his tires. My turn… FYI, these pictures are snapshots from my GoPro video camera so not the best quality but you should get the picture (pun…). Deby was behind me and (darn) I didn’t get any pictures but she made it just fine. I jumped off my bike and ran to the shore in case I needed to make a rescue attempt so I wasn’t thinking of pictures. So, that was about 9:30 AM and just the beginning… I didn’t take too many pictures along the way because riding the motorcycle was a full time job dodging potholes, washouts and debris in the roadway. My usual technique of riding with one hand and taking pictures with the other just seemed a little too dangerous. This picture is typical of what we saw in most cities. 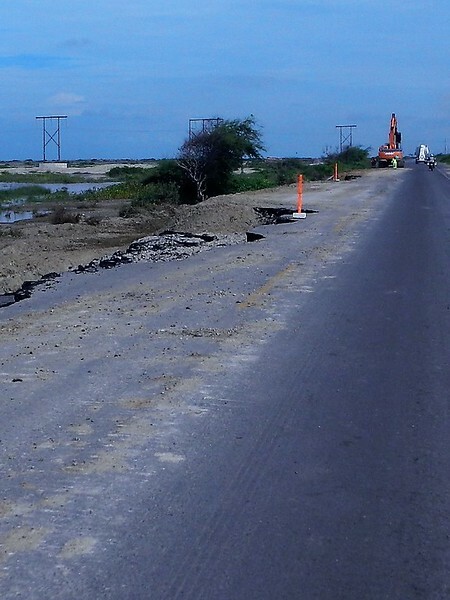 There is a part where the Panamerican Highway crosses the Viru river about 50 miles later. As usual we were stopped by the police and they were not letting anyone through. After some conversation with Nicholas between the police and some bystanders we were told there might be a way around…. go a few miles east to the city of Viru and maybe we could cross there. Sounded better than waiting for what could be days along the road in 90 degree heat so off we went. At the entrance to the city of Viru the police had a roadblock and nobody was being allowed into the city, at all. Nicholas went to work and after some animated discussion that took a while they let us into the city. Later Nicholas explained that he told the police we were suffering hot in the sun on the motorcycles and could we please enter the city to get some shade and water if we had to wait….. good thinking Nick! 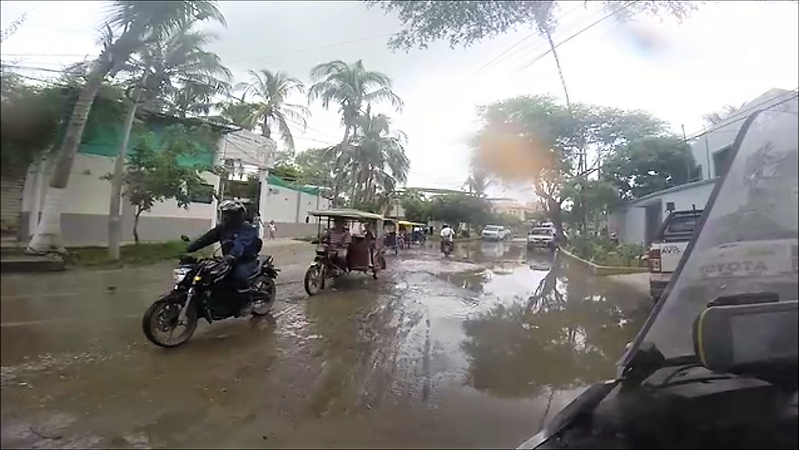 We rode into the city that was a absolute disaster, there was nearly a foot of rutted mud covering almost all the streets and many of the streets were completely impassable. People saw us coming and waved their arms and pointed in various directions. 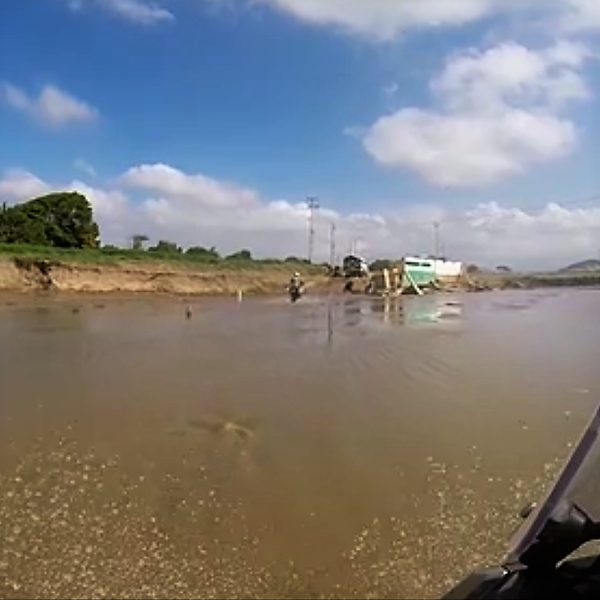 We circled around a few times and suddenly found ourselves at the point of town where the river was running completely through the center of town. People were walking across in deep water. The sidewalks were a little better for getting across but if we wanted to cross that was not an option. We stopped the bikes to access the situation. Immediately we were surrounded by the locals. Curious if we were actually stupid to attempt this crossing. Deby was the center of attraction. Should I be worried? Are they reaching in her bags? Distracting her while opening her trunk? Nicholas and I had our own crowds of people to contend with so it was each man for themselves. Worries, however, were for naught. These guys all just wanted to help. We sat for a long time watching walkers and the occasional person pushing a cart go down the street. We watched for current flow, drops (there were many) and general routes that might be passable. There is no knowing what was under the brown water, rocks, potholes, open sewer covers, literally anything. We did learn about halfway through there was a big drop. We watched this truck that actually backed in to unload something for the repair effort. He couldn’t get across but just dropped off equipment and then drove back towards us. It was tricky and deep for him so we thought we could make it. Notice the ominous clouds, waiting wasn’t really an option. The longer we waited the more we (Deby) befriended the locals. I had an idea…….. walking over to Deby and her bike I told her to put on her jacket and helmet, we’re going! 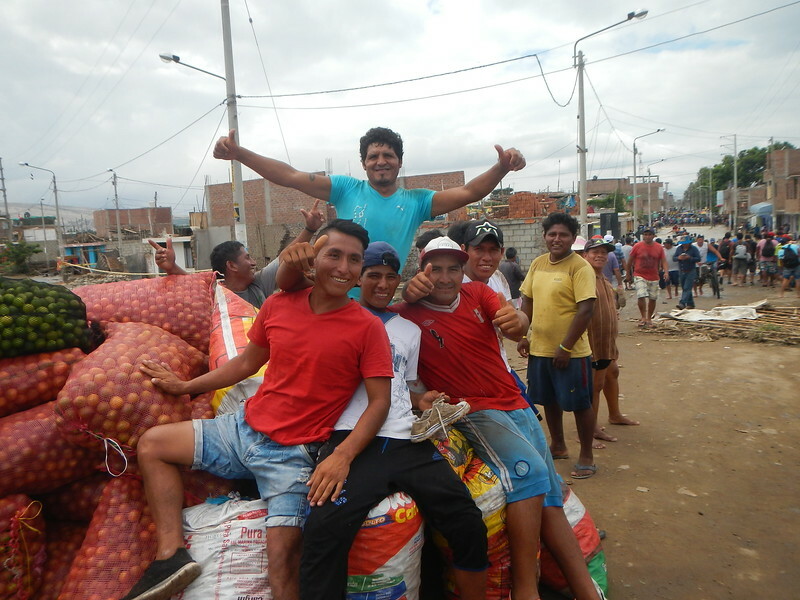 I pulled out a huge pocket full of Peruvian Sole coins and started passing them out the the biggest and strongest looking guys surrounding Deby. They got the message, we needed spotters! I ran back to put on my helmet so we had helmet to helmet communications and jumped in the water. Ok… let’s go! We were the center of attention surrounded by cheering crowds encouraging us on. No stopping now! Off Deby went, FIRST! I’m not exactly sure why, it just worked out that way. The “guides” seemed to know where the deep spots where and ran ahead and behind in case she got stuck. I followed running in my overflowing motorcycle boots with words of encouragement in her helmet and to be there just in case something went really wrong. She made it! At the far end was about an 8 foot gap that needed to be crossed. No worries they had a 2×6 piece of lumber crossing the crevice. We all decided riding up wasn’t an option so she got off and we pushed up the ramp. Success! One bike down and two to go. Nicholas was next, this time we got a few pictures. This next picture is my favorite, Deby took it while standing on the far shore. I think it pretty much sums up the crossing. 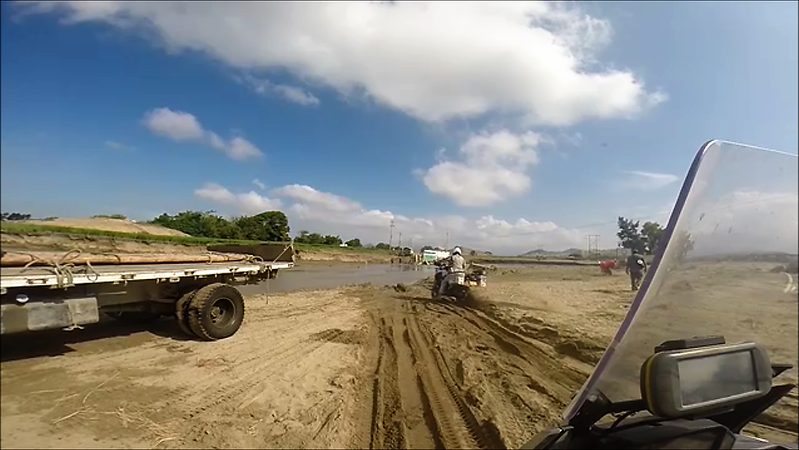 Next was my turn…..here is a snip from my GoPro camera. By the time I arrived they found another plank for me, nice. Discretion got the best of me, I made it this far and decided to do like the others and walked my bike up the slippery muddy plank with some locals as spotters. On the other side it was high fives all around and I even passed out my remaining soles coins to a bunch of happy people. Consider it my small contribution to the relief effort. Whew, soon it was back on the highway and the many, many washouts. The picture below was typical. 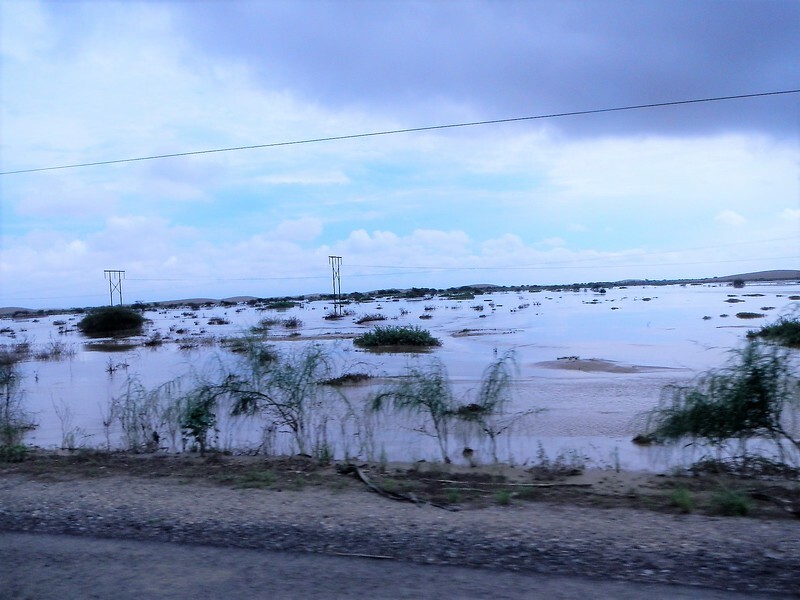 A few hours later we came to the city of Chicama and saw this. This was bad. We watched a heavy equipment truck crossing with water up to it’s headlights. Not good. Not to mention the sight of the washed away bus on the left. As usual the police weren’t going to let us cross. Now what. Nicholas to the rescue….. talking with some locals they said there is a way around followed by a bunch of hand waving and directions. I zoomed in on my GPS, there was no road according to Mr. Garmin. Nicholas seemed convinced so off we went, actually west towards the coast. Wouldn’t that be worse? What road are we supposed to take that isn’t on my GPS? Is this smart? Needless to say it worked out. The small road led to an ever smaller farming road that led to an ancient one lane concrete bridge across the river that was still standing. I guess they don’t make bridges like they used to. We were glad to see an actual bridge and crossed onto an unmarked road that took us back to the Panamerican Highway. Another river crossing under our belts. 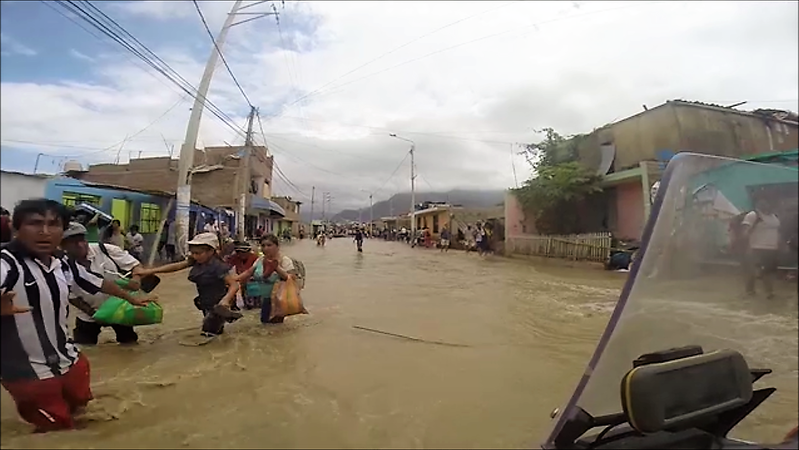 The rest of the day was typical of the following picture, washed out roads with temporary repairs to get people across. I lost track of how many of these we crossed. By 5:30 PM we were in Chiclayo. Nicholas recommend a fantastic hotel Casa Andina in the center of town while he decided to check into a less expensive hostel on the north end of the city. Once again (this seems to happen to us a lot) Deby and I found ourselves in the lobby of an expensive hotel dripping mud and muck all over the lobby floor while hoping for a room. We went 262 impossible miles over the course of nine and a half hours. We rode in full riding gear in the 90+ degree heat. Our boots were pools of water for most of the day. $90 USD for one night? Air conditioning? Restaurant? Beer? The best deal of the trip. Never mind during dinner the power to the hotel went out (twice) an at night the air conditioning stopped working. 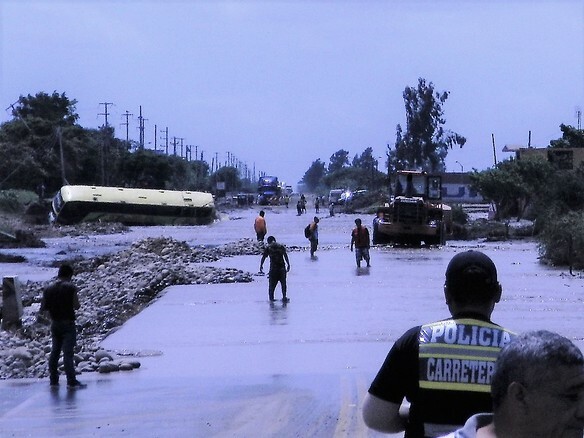 The city and region was still in a state of emergency. We didn’t mind being a little inconvenienced. 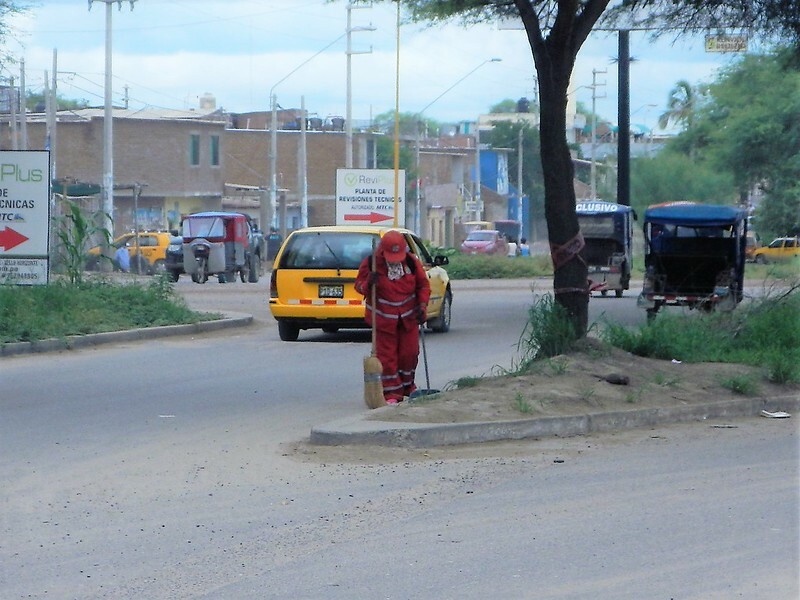 We watched the news and two cities seemed to be featured, Piura and Sullana, our destination for the day. Nicholas wanted to leave early… before 8:00. I negotiated for 10:00 and we settled on 8:15 (goes to show my negotiating skills). Good thing we left early, it was over a 10 hour day. The first stretch was through th Sechura Desert….. aren’t deserts supposed to be dry? Not this one. Washouts and flooded spots were common. It was surreal seeing sand dunes surrounded by water. In many places the road seemed like an island in the desert. 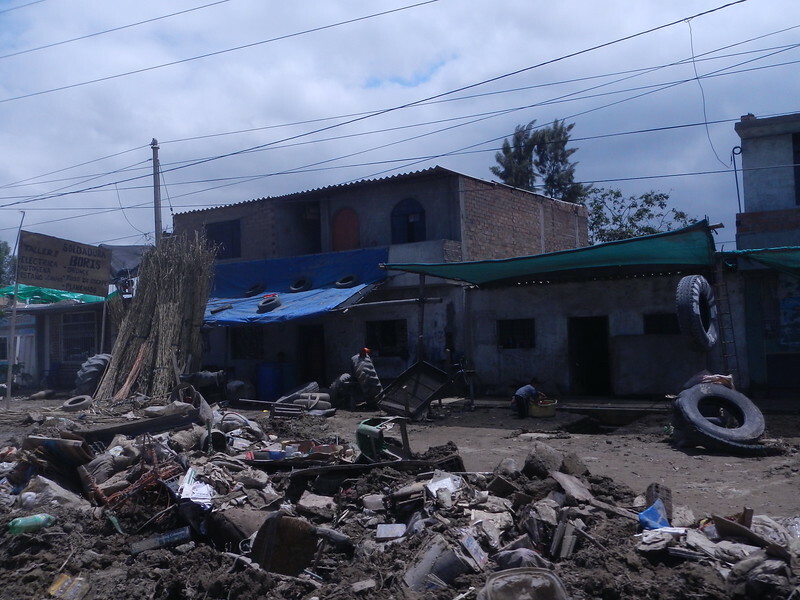 We got to Piura and the town was a complete mess. There was no running water so use of a bano wasn’t going to happen. We stopped for gas and got directions from some locals. 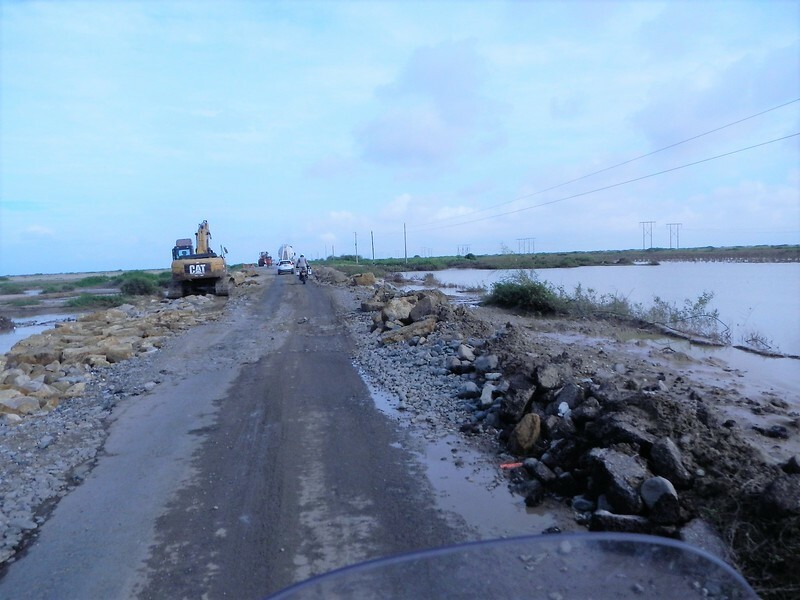 The road north to Sullana was impassable. This is from accuweather.com March 24, 2017. The day we rode through. 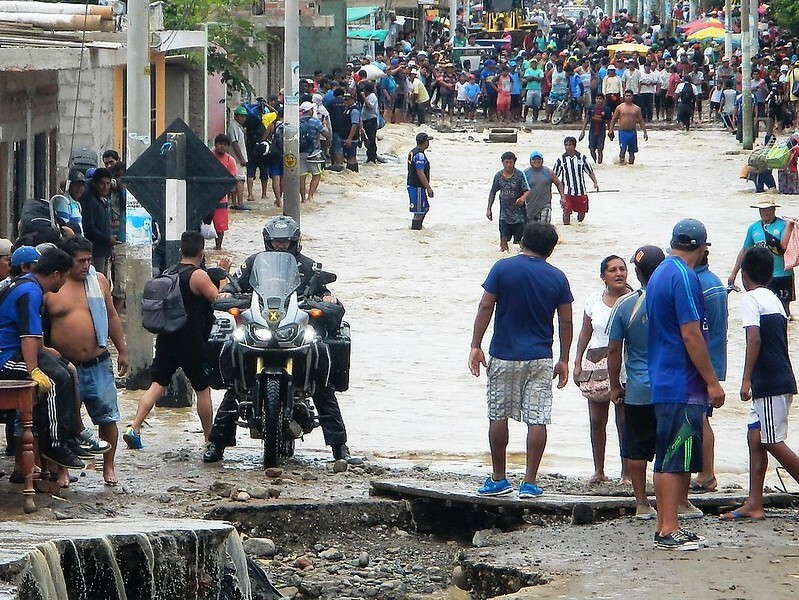 “Piura, along the northern coast of Peru, has been inundated with 631 mm (nearly 25 inches) of rain since the start of the year,” AccuWeather Meteorologist Jim Andrews said.A total of 55 mm (2.17 inches) fell alone in the 24 hours ending on Wednesday morning.“Piura averages less than 75 mm (3 inches) each year,” Andrews said.A warming of the ocean waters off the coast of Peru may be linked to the unusually heavy rainfall over recent weeks. Here’s Nicholas getting a road report from the local tuk tuk driver. 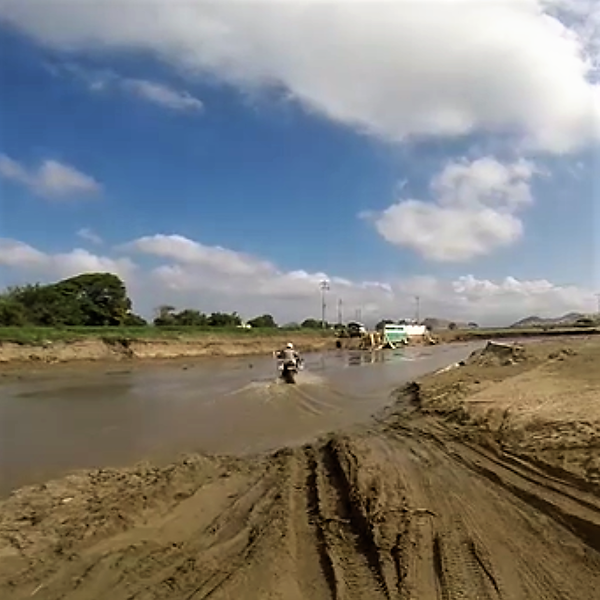 We noticed the cleanup of the city was underway…..
A GoPro snapshot of Deby negotiating the mud and traffic. Really a lot of the city was like this and much of it was worse. We wound our way out of town, only having to go the wrong way on one-way streets a few times and once jumping a curb for a short sidewalk ride. 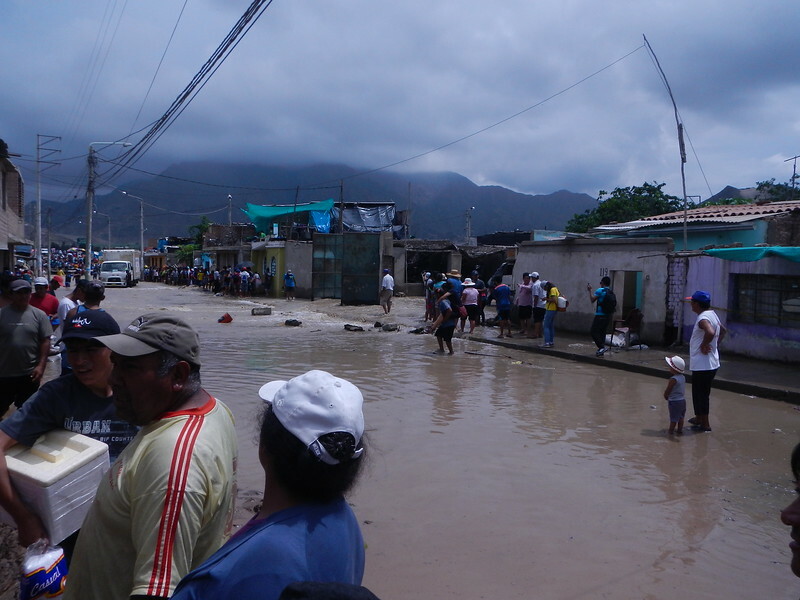 It was hot, humid and crowded in the city with many detours because roads were just not passable. But we made it and found ourselves on yet another detour to get around Sullana. We found a small black road on my map that led north to the Ecuador border. Yes, it was a nice road climbing into the mountains and the terrain turned green and hilly while the temperatures moderated. Ahhhh, it not only started to look like home with green hills but the cool temperatures felt like home. Just before 4:00 PM we reached the border with Ecuador. It is the same place we crossed with MotoRaidII four years ago. A sleepy border crossing without much activity. Even still it took about an hour to get across but we were glad to for the chance to rest while we waited. 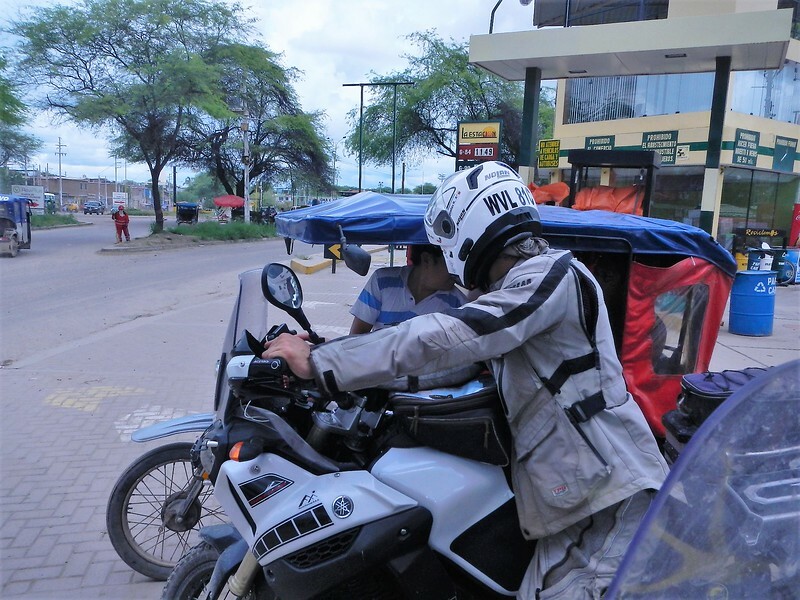 According to the guards it was a 3 hour ride to our destination of Loja, the first major city in Ecuador. We knew we wouldn’t make it before dark but decided to continue anyhow. Just as it was getting dark we stopped for gas in the small town of Catamayo. We decided this would be as far as we should go for the night and decided to look for a hotel. Immediately Nicholas and I had our smart phones out and were searching Google for hotels. Deby, the more practical one, looked across the street and saw a giant billboard for Rosal Del Sol hosteria. Ummmm, why don’t we stay there? The hotel was directly under the billboard. Good move Deby. So we made it through Peru. 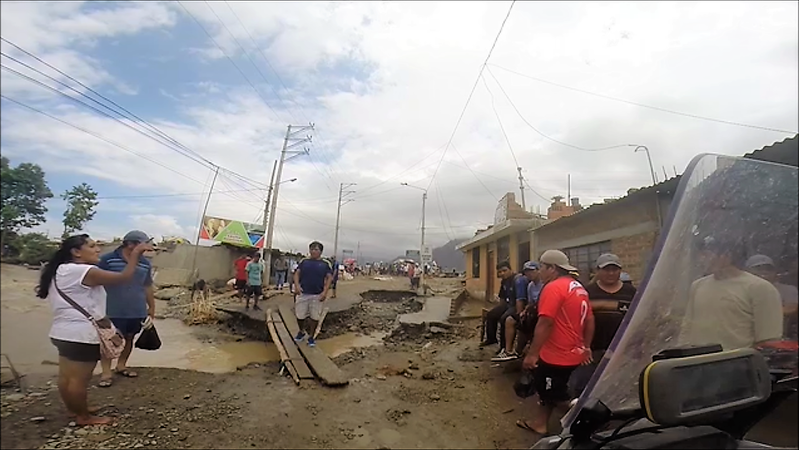 It’s amazing to me how much the disaster here is not in the news in the US but actually I think that is somewhat typical for these types of things. It’s terrible for the people here. This entry was posted in MotoRaid III, Motorcycle Adventure by donnh. Bookmark the permalink. 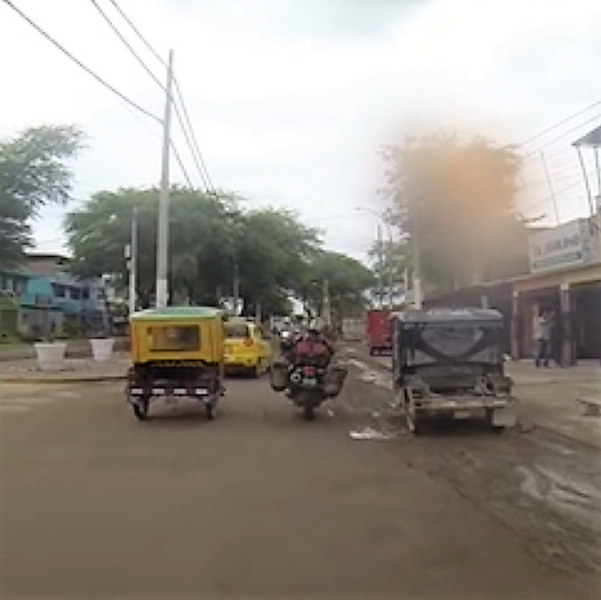 Glad you made that far and safely. Seems like a lot more than just an adventure but a full on escape from disaster. 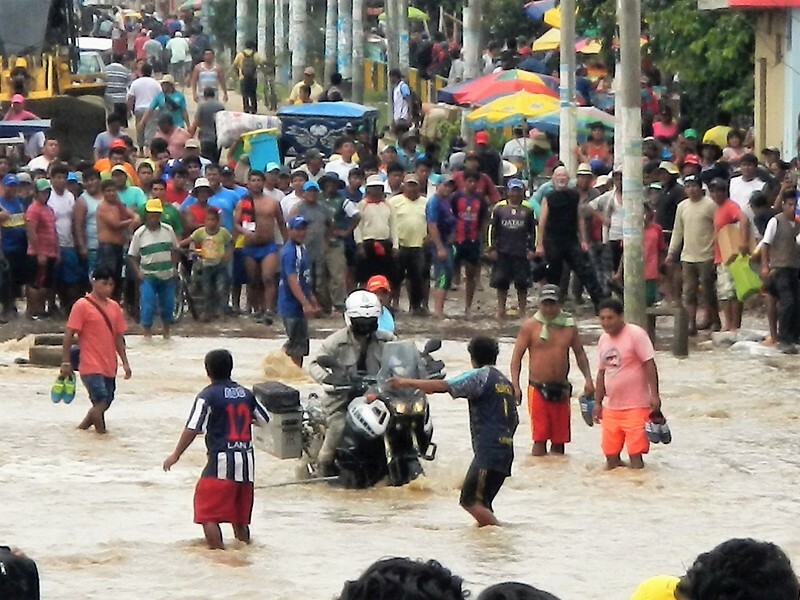 You’re right about the news here, you really have to search to find anything out about Peru’s flooding, we’re consumed with the latest shenanigans from the other Washington. Hopefully a few days of rest, food and water (to drink) is forthcoming. Badasses! Not too many can do what you are doing. The ride is amazing, you and Deby are amazing. Glad I did the easy tour with you. 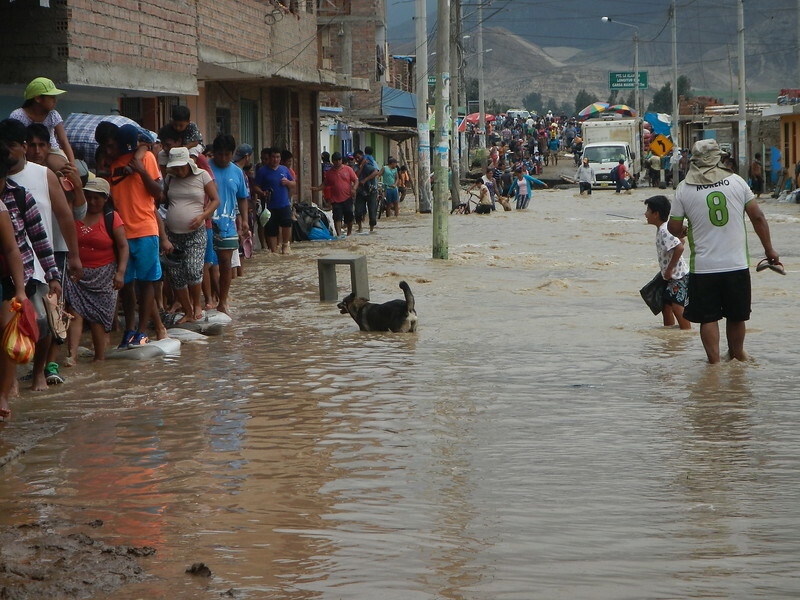 I do recall that we complained about how lousy the accommodations were in Northern Peru. Guess I’ll stay quiet about that now. Sure hope Ecuador is better. Are you going to try to stay at that great place on the lake we found? Oh man, I’m tired just reading this latest installment of your odyssey! Be safe, you two! This story is just surreal, I’m glad you’re safe and I hope your journey gets easier. You’ll never forget this experience! Enjoy and recharge! The commentors above say it all …. I can only say Unbelievable … You guys are tough ….